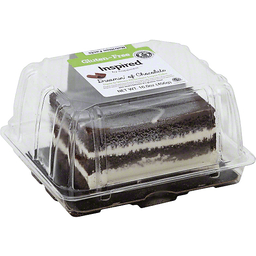 Finally, a truly delicious & moist chocolate cake with layers of the finest Belgian white chocolate mousse. Topped with decadent chocolate ganache, you won't believe it's gluten-free! Kosher certified. Gluten-free. National Foundation for Celiac Awareness (Used under license). www.Gf-Cert.org. Certified gluten-free. Inspired by happiness. Dreamin' of chocolate. Any questions please call us at 1-844-33-Happy. inspired-by-happiness.com. Product of Canada. Inspired by happiness. Gluten-free. Certified gluten-free. National Foundation for Celiac Awareness. www.Gf-cert.org. 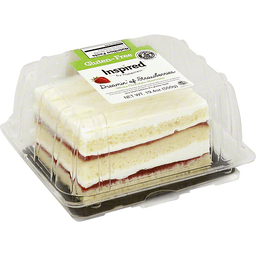 Finally, a truly delicious & moist shortcake layered with succulent strawberry fruit filling. Topped with real whipped cream and white chocolatey drizzle, you won't believe it's gluten-free! Any questions please call us at 1-844-33-Happy. inspired-by-happiness.com. Product of Canada.